Here's a trailer for Scott Dreier's show Doris & Me. It's fantastic! Doris & Me is a show celebrating one man’s quirky, lovable obsession with music and movie icon Doris Day. As the ultimate obsessed fan, Scott Dreier creates more than your typical tribute show–this is the celebration of a timeless artist, as Scott takes the audience with him on a sentimental journey to nostalgic times gone by. As he lovingly shares through classic treasured songs, personal anecdotes, humor, heart and many Doris Day stories and history, Scott never lets us forget how much he loves her and why he has become Doris Day’s biggest fan. Doris Day’s 90th Birthday Party – Doris Was the Surprise! "The celebrants were finding their tables when a buzz from the entrance caught their attention. Then a voice … 'she’s here!' The room was electrified, tears were streaming down the faces of adoring fans, who were experiencing a major mass realization that their lifelong dream was about to come true..."
"Party guests cried (hey-it was their party and they could cry if they wanted to) and hugged each other when they realized that the guest of honor, actress/philanthropist Doris Day, had quietly walked into her own 90th birthday party the other weekend..."
Singer-songwriter Patty Carver will present Sentimental Journey, The Music of Doris Day, at noon Sunday, May 4, at the Heritage Hotel. 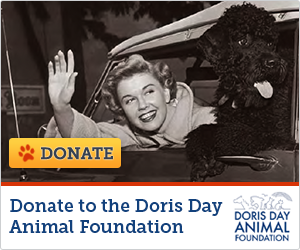 Here's a great way to support the dDAFor those of you who shop at Amazon, you can go to smile.amazon.com and choose the Doris Day Animal Foundation as your charity. Amazon will then donate a portion of the purchase price to the DDAF.